October 26, 2010 by Karen H.
I sat outside St. Peter’s Basilica twice this week. Too late to get in the building, I made do with sitting in the square and remembering. I could not be in Rome and not pay some kind of homage to this holy place. In July of 2007 I was busily getting ready for a series of meetings in Rome and trying to plan my day and a half of weekend sightseeing that I had tacked onto the trip. Then the phone rang and I heard horrible news delivered in a deadly calm voice. A group of people working on a project I was managing had been hit by a car bomb. One was dead, five others were seriously injured. Stunned, grieving, guilty, and heart-wounded, I set out for Rome. I slept walked through my meetings and finally escaped to wander the city, trying to find solace in a strange place. I found myself drawn to Rome’s churches, and wound up at the Vatican. As I walked into St. Peters, I was awestruck by its enormity, and touched by the crowds of the faithful. I found a side chapel, sat down, and wept cleansing tears. I feel like I put my head back together in St. Peter’s Basilica, and left that day able to deal with the personal fallout of this crisis. I felt amazing strength and peace there. Why? I’m not a Catholic. While I respect followers of the religion, I frankly do not know much about their beliefs. But I did feel, sitting in that chapel where millions have worshipped, and so many were clearly worshipping right then, the combined strength of their faith. I’m frequently struck by the idea that the faithful of every religion leave a geographic legacy that is not precisely tangible, but is somehow captured in their holy places. I feel it in the holy places of Mormon history, I feel it in the cathedrals of Europe, and I feel it in mosques in the Middle East. Whether or not I agree with the doctrine or theology, I am blessed by the legacy, by the holy places of others’ faiths. Maybe it is a concrete way that I can connect with others in my human family and pay respect to their individuality, choices, courage, and lives. I can sit in their holy places and appreciate that they are holy. Last month we were wandering through churches in Rome on a Sunday morning, and found ourselves at Sant’Ignazio (not far from the Pantheon) as Mass started. We decided to stay and take a quiet, restful break from the constant bustling around of our vacation itinerary. A wonderful old pipe organ and a small, very competent choir enhanced the ambiance. While Communion was distributed, the choir sang Mozart’s Ave Verum Corpus, one of our favorites, for the Eucharistic hymn. Sublime moment. Beautiful Karen. And true. Thank you for sharing. In my youth I spent several weeks traversing Europe, singing in a choir with my future wife an several members of my family. We sang in at least a dozen cathedrals during that time. My wife, raised Catholic, would be baptized into the Mormon church a few months later. I treasure the chance I had to learn to appreciate the faith of her youth. We take our kids to mass with my in-laws occasionally and always are uplifted. I find myself drawn to cathedrals simply to admire the beauty inspired by sincere devotion. A few weeks ago I attended Mass on State Street in Chicago while on vacation, the first time I had attended alone. Aside from the fact that I was glad to be in a space where I could sing the hymns as loud as I wanted (without sounding ridiculous) backed by a monstrous organ, I was again struck by the sincerity and reverence of the worship and the beauty of the space. It made me rejoice in the fruits of their labors. I also felt impressed to admire my wife with renewed zeal; what tremendous faith she had to part ways with something so lovely. To put it another way, the faith she built during her Catholic upbringing provided ample preparation to accept further truth when she found it, but there must have been a strong sense of loss when she followed that truth and joined the church. Your experience evokes questions concerning how we enact the sacred in our communities. Sacral connections are held and sustained by those willing to re-enact their meaning and I suspect that our spiritual lives will be richer as we are able to respectfully engaged the sacred networks of other faiths. I had a similar experience in a Hindu temple recently which I have been thinking about writing up. Thank you for sharing Karen. A group of people working on a project I was managing had been hit by a car bomb. One was dead, five others were seriously injured. Can only imagine what that would be like. I’ve been in the vicinity of some bomb attacks, but no one I have known has ever been injured or killed. Glad you could find some comfort and solace in a sacred space. Normally I just lurk here, but couldn’t quite resist this. Years ago I had a fascinating discussion with Truman Madsen about whether “places” could be holy, or rather, how they became holy. He pointed out that in one sense, we don’t really believe the earth (and perhaps things built from the earth) is inanimate. If “two or three gathered together in My Name – there I am also” is true, and those “inanimate” walls are not so inanimate as to be unaffected by the presence of the Holy One, then almost any place of worship will have traces of the Divine. My husband is a composer and frequently commissioned by churches of all denominations. We have been in hundreds of churches over the years, and I have to say, it is unusual not to feel a sense of “sacred space” in all these buildings, from the smallest Baptist Church to Catholic cathedrals to our own Tabernacle. To Cort: congregational singing —> Church of the Brethren. We have a wonderful congregation in Bridgewater VA who has commissioned my husband enough times that we feel like honorary members. Our kids used to ask to attend there periodically just to sing the hymns. i haven’t read or commented here in quite some time, but i have to say that i was drawn to this post. i’m catholic but am an investigator of your Church and have been for years. i am happy to read that it’s not unusual to have these feelings in other religion’s sacred places. i love the traditions and solemnity of the Catholic masses so i especially appreciate Cort’s comment above regarding his wife and all that she gave up in leaving her Catholicism in order to grow and gain through her LDS faith. it warms my heart to know that i don’t have to NOT feel anything, and that in fact, my feelings in my Catholic places are A-OK. i need to read this today. thank you. Wonderful post. Isn’t it great that the holy spirit is not limited to one place or one faith? Beautiful building. I have to say I’ve often lamented the fact that such grand houses of worship have been reduced to museums for 90% of the people passing through them. It made me wonder and pray that the day will never come with thousands of tourists might pass through some of our temples and see what seems to be relics of a forgotten faith. Not of course that there aren’t faithful Catholics… not by a long shot. I’m always touched by the handful of people here and there I see in these buildings in the corners praying with tears in their eyes. It’s just sad to me see such amazing monuments of faith often be reduced to little more than art and sculpture in the eyes of the millions of people who pass through snapping photos. Even in some of the literature in the Vatican I thought it was interesting that more tribute was often paid to the artist, the medium, choice of paints, etc. than the story the artwork/sculpture was depicting. I see this all over the museums with religious art. It gets reduced to art, and the religion, faith, etc. gets lost in the summaries while often all we read about is what shadows or highlights of choice of color the painter was using. I can only think that the faithful artists who labored on these things would lament the fact that the medium has taken over the message in the minds and eyes of many. Perhaps a reason why we can appreciate our temples being plain but beautiful. When I was a missionary in Germany I frequented the cathedrals whenever I had a chance. I absolutely loved being inside of them, especially the oldest ones. When a choir was singing in those halls the place took on a whole different character. I also had an opportunity to visit a mosque. My companion and I tracted into a devout muslim family. The man of the house was very interested in sharing beliefs and we found a commonality amongst ourselves on many levels. Than he invited us to visit the newly completed mosque. We accepted and he drove us to it. Upon entering we got some very angry looks from some of the men inside the gate, but he told us not to worry, the mosque was open for anybody to visit. Still, we stuck close to our guide. He took us into the washrooms, the prayer rooms where we removed our shoes as we entered, and even up into the single minaret. The workmanship was a little spotty, but still it was a holy place where these people were devoting their time and money to worship. After the tour my companion even bought a Koran from the bookstore. I wasn’t interested in one at the time, but wished I had done the same later on. One other holy place I visited, was holy for a completely different reason. It was the remains of a small concentration labor camp from WW2. As we toured it the spirit was very strong, but also different from other holy places I’d visited. It was a place of great sacrifice and cruelty. It really felt as if the blood of the dead was speaking out of the ground to me as we toured the grounds. I won’t ever forget that place or feeling. Thanks all, I love hearing your stories of visiting other houses of worship. I think that sometimes we get a little too enthusiastic about comparing our own worship experience with the very sincere experiences of others. It’s good to take some time to recognize our common ground. I loved this, Karen. And Jane G., your comments were brilliant. Thanks for sharing your perspective. Karen – Thanks for sharing this story with us. I have come to believe that a “Holy Place” is wherever we may have felt God’s spirit touching our lives – no matter where it is. The most memorable spiritual experience of my life happened while I was driving on the Capital Beltway. I sometimes like to tell myself it might have been becuase it happened just a mile or so from the Washington DC Temple but I think it had more to do with the circumstances of my life and my frame of mind at the time. In 2003 we visited St Isaacs church in St. Petersburg, Russia. It was a Sunday morning and as we walked through the voluminous space of the church I heard a choir singing. The song was sung in Russian but the spirit of the message was clear to me. I thought it sounded like a choir of 100 people or so and I assumed it was a recording played over the speaker system. But then we came apon a small side chapel and I saw a group of less than 15 singers producing that glorious sound. I believe that the faith of devoted disciples, regardless of their particuler theology, will always create a Holy Place for us to experience. Thanks again for writing. One of, if not the, greatest treasures of the Russian Orthodox Church is its tradition of acapella singing. I have also been to St. Isaac’s and it is an awesome, (in the original sense of the word), example of the Russian Imperial Style of architecture. But the architecture of most of the larger Russian churches acoustically lends itself to the rich enhancement of human voices in song. That and the rigorous training that the choirs voluntarily endure to provide that vital element of worship. (Russian are trained to sing from the diaphram which allows their voices to sound richer, moving,and loud.) The delegates returning from Constantinople reported the same thing to the Kievan Prince Vladimir, who by royal degree, made Christianity the official religion of all Kievan Rus in 982 A.D. The delegates told the Prince that when the singing began they felt as if they had been transported from earth to heaven. I, myself, felt the same way in many Russian churches when the choir sang. chris–careful! Rameumptom falls can result in serious injury. I always like the architecture and art of buildings like this, but I can never help thinking of the peasant serfs/slaves who were abused in the construction and financing and kept in ignorance by their ecclesiastical overlords. I have a hard time not seeing blood oozing from the walls. How can a space be sacred and holy, even if it functioned for centuries as the center of power for a corrupt organization whose leaders made themselves rich off the abuse and deaths of millions of people? Is it right even just to admire such a place for aesthetic reasons? Seriously, folks?? Take the anti-Catholic nonsense somewhere else. Monticello’s a pretty good target for self-righteous preening, if that’s what you’re after. I met a Muslim man that was relatively high ranking Air Force officer under the Shah of Iran. He escaped after 8 years of severe torture under hands of Khomeni (sp.). He told me that while at St. Peter’s basilica he had an overwhelming spiritual experience which brought him to Christ. Those holy ghost experiences were replicated when he studied the bible with some christians and was baptized. Then he was working on LV temple construction (he also had great skill in glass work) he also felt the spirit. He got a BOM and felt the same spirit again. I baptized and confirmed him into our faith. Awesome spiritual man. People sanctify and make holy places—and there has been a lot of faithful people at such sights–including the Vatican IMO. It’s no more anti-Catholic than you’re acknowledgement of Jefferson’s ties to slavery is anti-American. It’s an important question that I don’t have a good answer to. It’s been my experience that literature from the Church or Church members on the apostasy almost always discusses the historical abuses of the Roman Catholic church, and uses these as evidence of the loss of authority and truth. I wonder if this traditional view leaves room for the kind of experience Karen described (and which I think is valid). If the “traditional view” doesn’t leave room for the kind of experience Karen describes, the traditional view needs some updating. And if exploitation of workers is evidence of institutional apostasy, well, then there is none righteous, no, not one. There are some good meds for that, Owen. Redrum! Redrum!! #24—Exactly! Isaiah couldn’t have said it better……. Anti catholic? What? Maybe I communicated poorly or you’re anxious to assume the worst of someone you’ve presumably never met. It sounds to me like you read between the lines wherever possible to assume the worst of someone. Jenni, I think most of the people who have posted positive comments have solid reasons (doctrinal, historical, cultural, etc.) they haven’t chosen to follow Catholocism/Islam/whatever. They just choose to focus on the good which obviously exists. The point is that we rejoice that the Spirit can benefit sincere religionists everywhere regardless of loss of authority and truth or even historical abuses. Even within the restored church, warts abound, so we should count ourselves equally as lucky. I think spaces are made holy by the presence of the sincere; I see no reason why past misdeeds disqualify a space filled with present devotion. Admiring cathedrals for their aesthetics and, more importantly, function is an endorsement of the best that occurs there, not the worst. But it’s about more than that, isn’t it? It’s about more than a thousand years of war, genocide, false doctrine, and tyranny. To some, St Peter’s is a powerful emblem of that. Our scriptures tell us not to let any unclean thing into our holy places, and that the Lord does not dwell in unholy temples. What makes a place clean or unclean? chris, I guess I don’t need to argue the point, since Jenni has just demonstrated that I was not wrong to infer anti-Catholic sentiment. Jenni, certainly Catholicism has institutional sins to repent of. But do those make irrelevant the two thousand years of good which that church has also produced? Good, even at times, occurring at the same time as the bad? The history of European Catholicism in colonial America, for instance, is not simply one of unrelenting destruction and one-dimensional cruelty, but rather one of confusion, complexity, and well intentioned people who actually did right occasionally along with their wrongs; look up Bartoleme de las Casas, the pope’s condemnation of Indian slavery in Sublimas Dei and slavery in general in 1839, for instance. You speak of Catholicism’s “leaders” as though they have all without exception sought power for cynical and self-aggrandizing reasons, and as though Catholicism has been from the beginning a cesspool of corruption and abuse. This is, as it is of any institution, patently false; Americans held slaves for decades, elected Warren G. Harding and Ulysses Grant and Richard Nixon president, and we have at times tried to conquer places like the Philippines and Mexico, but this clearly does not mean we can say that the history of the United States can be fairly characterized as only two hundred years of corruption and abuse of power and tyranny. You accuse Catholicism of “false doctrine,” when in fact Catholicism’s insistence upon the necessity of priesthood and sacraments actually places them closer to LDS doctrine than Protestants doctrine is (which, actually, Joseph Smith noted). That is to say you paint with an exceedingly broad brush. Not every holy place is holy for everyone. I think what I was trying to say gently in my post, but maybe I need to say more forcefully in the comments is that it is a bad habit for Mormons to be so self-congratulatory at the expense of other religions. On a basic level it’s smug. On a more complicated level, it opens your own religious beliefs to broad brush attacks. No one can withstand the bar of being judged according to the combined actions of every co-religionist over thousands, hundreds, or even one year of history. No one. Not Catholics, and not Mormons. Not to mention the fact that reducing the complex history of an entire religion and its socio-political context over 2000 years to one sentence is lazy, silly, and again, smug. I feel reverence in places that others treat reverently. That’s an important lesson for me. It’s eye opening, and it gives me a greater understanding of humanity and a greater understanding of God. I wanted to share that in this blog post. I’m not interested in debating the merits of another religion. I care too much about my own personal beliefs–and the hard won place they hold in my life– to be that hypocritical. Every institution will have the scars of thousands (millions? bazillions?) of corrupt works rendered by a similar number of unnamed perpetrators on equal unnamed victims. Ours is no exception. The same institutions are hallowed by unnumbered (except by God) acts of devotion and piety rendered by individuals reaching for closeness to their Creator. I guess one sees what one is looking for. You can’t divorce a product or a place from its history. I’d like to visit the Louvre, but the fact is that none of the art there, or even the building it is housed in, would exist if not for King Louis’ abuse and Napoleon’s plunder. I don’t think it’s right to simply by a ticket and enjoy the art, without being conscious of its real cost. There’s a conflict there that I don’t think can be easily resolved or ignored. You’re right, I have been one-sided in my characterization. I do recognize that the Catholic church has done good throughout history. I like your comparison to American history, and I think it’s a good one. Maybe this could help me explain myself. I like the Constitution, and I can accept the notion put forward in Mormon scripture that it is an inspired document (at least in the sense that God influenced it’s authors in some subtle way). I recognize, though, that it was written by privileged members of a slave society, and that it endorses slavery. I am skeptical when people go beyond admiration for the good qualities of the Constitution, and actually view and describe it as a holy document, almost next to scripture, without acknowledging the evil it was a part of. The same goes for ‘founding father worship’. What I have been trying (failing?) to express is the need to look at a place like St Peter’s within its historical context. I think what I object to is the notion that it is a “holy place”. My understanding of the history is that the men who controlled the Catholic church were, at that time, more often than not, interested in political control and wealth, two things that I do not see as at all “holy”. 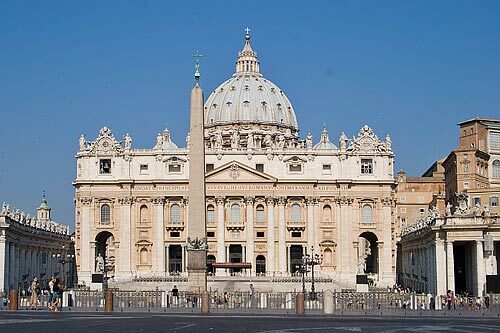 From what I understand, I am deeply skeptical of the notion that St Peter’s, along with other contemporary Church projects, was erected solely for the glory of God, and not the glory of the Papacy. While I’m sure that many people visiting St Peter’s have the kind of experience Karen did, to talk about the “holiness” of a place like St Peter’s presents a narrow view of truth and does a disservice to the word and the concept of “holy” sanctuaries. Karen, nice post. Your last paragraph in the OP sums up my experience as well. How holy a place is depends on two things to me, the intents and faith of others who have gathered there, and our own intentions and faith that we bring. I can understand both reactions to St. Peters that have been described here. Our own approach often makes all the difference in how we feel about a place of worship. re: 33 Fair enough. I suspect, however, that The Vatican is uniquely powerful in its ability to trigger feelings of reverence in some and just the opposite in others. So perhaps it’s not surprising that your thoughtful post elicited divergent comments. “I guess one sees what one is looking for.” I would argue that one sees through the lens of one’s background. The Carmelite nuns believed that opening a convent at Auschwitz was the will of God for a sacred place; the Jewish community felt just the opposite. We see echoes of this in the debate over opening a mosque near ground zero. The notion that we can universally “sit in their holy places and appreciate that they are holy” strikes me as a bit, well, naive. I don’t think that’s just my own willful blindness, Mommie Dearest. If I were on an art history tour, I would no doubt focus on the art. If I were with a group of architectural students, that’s probably what we would talk about. If I were touring the Vatican during a semester abroad studying Italian history, that’s probably what I would notice. But Karen was in a church during a time of emotional distress when she needed spiritual strength. Why is it so surprising that feelings of devotion and holiness were uppermost in her consciousness? And what right does anyone have to suggest that she shouldn’t have felt that way, that she should instead have experienced the place through the lens of someone else’s needs or bigotry or interests? Thank you for this post, Karen. 38 was offered with tenderness, softness, and a total lack of abrasive intent. I regret if others’ thoughts are focused elsewhere and experienced it differently. Anyone who has been around BCC for more than a day knows what would happen: a bunch of people would immediately insist on the basis for such an opinion. Jenni would then write what she wrote above, and then the same bunch of people would respond in the same fashion as they have. All Jenni did was allow everyone to skip the middle step–we should thank her! Sorry, scratch that last post. My daughter got to the keyboard. My earliest memories are of sitting in a Catholic church, pondering the truths of the universe, occasionally feeling the presence of the Spirit. I felt many times it was my holy place. When I read the Book of Mormon for the first time, and prayed about its truthfulness, the answer scared me so badly I ran to my holy place and luckily enough, I was able to run also to confession. The priest, with his wonderful Irish brogue, gave me not only permission but his blessing to join the LDS church. Unheard of! It will always be a holy place to me. I think it ought to be considered at least a matter of personal opinion what is considered a holy place or not. Joseph Smith felt a grove of trees was a sacred place. Who are we to judge? When I was at BYU and felt the sting of human error in a church setting, I worried an LDS chapel would never be my holy place. I had a returned missionary roommate who was my rock and helped me steady my feet. That was Karen H. As my life shifts and turns, I realize holy places are hard to come by, and needing a history lesson about each space needn’t be a prerequisite. This is just my opinion. “….what right does anyone have to suggest that she shouldn’t have felt that way…?” I agree, Ardis. Nobody does! And nobody did. I skimmed through all of Jenni’s comments and don’t see her suggesting Karen H shouldn’t have felt the way she did. I didn’t make that assertion either. On the contrary; please comment 32, sentence 2. Whew. You must be a real hoot at parties. In that case, I apologize, Jenni. Holy sites are like swear words, if people attribute significance to them, then that very act makes them so, in spite of whether or not they are in any objective sense. The traditional site of the crucifixion is gaudy to the point of ugliness and as much as a quarter mile away from the area where it was likely to have happened, but it remains a remarkably holy site purely on account of the reverence that so many people attach to it. In other words, the Church of the Holy Sepulchre is the F-bomb of holy sites. #41 is awesome. I too have wondered sfgyuu. sfgyuu looks like it might be a Finnish word, but I’m thinking an exotic dish at a Korean buffet is most likely. I was thinking it was an Icelandic cleansing ritual. I could have expressed that way less provocatively. People are entitled to feel whatever their experience brings to a place, which makes the perceived holiness of a given site variable indeed. I remember being brought to tears as I watched (on TV) the Pope conducting Mass in Central Park. I was deeply moved in a Hindu temple in China as I watched a woman worship at each idol, bowing low as her incense curled into mist which I thought must surely hold a prayer. I am better prepared to be moved by LDS Temple worship, and I almost always am. In the Temple, I come the closest I can to revelation. But I feel peace and good will in any setting where worshippers gather. I think our hearts can be trained to feel something holy in a setting we understand is set apart for precisely that. Despite Jethro Tull’s condemnation of “the bloody Church of England” I found Evensong at York Minster to be an incredibly moving spiritual experience. Funny, I wasn’t thinking of Catholics in particular at all. Most of the great wonders of the world are soaked in blood. Building big, cool things without oppressing the masses is a pretty new invention everywhere. Just like marriages that are more often good for women than not and patriarchy that doesn’t get anyone killed. Well, except that before, even if a marriage meant you were property, it was probably better than being homeless and penniless… Oh the wonders of the past. Gee, I sure hope the GOP takes us back there lickety-split. Just remembered my prof at BYU who refused to ever go to Carthage Jail. Strange how for some a place like that can be holy and for others a horror. Indeed, one could argue it hasn’t been invented yet. I love this statement. It is something I have long struggled to express to myself and to others. I think that Mormons have a bad habit of occasionally believing we have some sort of monopoly on the goodness market, but I am certain that God works through all of His children in many different ways. Concerning the idea of looking at all the horrible atrocities that contributed to something… How far back shall we look? In order to have the LDS church, we had to have Europeans come to America, which means we have to accept that the LDS church only exists today because privileged white male Europeans brought death, disease, torture, and slavery to our nation. How dare we build a multi-million dollar edifice near the capital of the nation that allowed slavery until the middle of the 19th century, Jim Crow laws, segregation, wars, conquest, and pestilence of all sorts? There are warts in every history. That doesn’t mean that we should label everything associated with those warts. Alex, my anecdotal observation is that although Mormons may not necessarily be more “good”, they are definitely less cynical, and that is good enough in itself. #12: One other holy place I visited, was holy for a completely different reason. It was the remains of a small concentration labor camp from WW2. As we toured it the spirit was very strong, but also different from other holy places I’d visited. It was a place of great sacrifice and cruelty. It really felt as if the blood of the dead was speaking out of the ground to me as we toured the grounds. I won’t ever forget that place or feeling. would that have been Dachau, Steve G.? Served my mission likewise in Southern Germany and wholly agree. My wife and I went back to Munich for my 50th birthday, she wanting to visit Dachau which we did on Sunday after attending services in Munich. Needless to say, the contrasts we experienced that day can not be forgotten….and never should be…. In a recent General Conference, Elder Scott talked about good people in other churches. He pointed out that those other churches have the same basic moral code as ours, therefore, our difference is in the Authority. We should respect their good principles, and teach them that we can give them something in addition to the good that they already have. He said it much more eloquently than I, so I suggest that you can look it up on the Church Web Site, where they have now put the Conference proceedings. Ned, it makes me a little sad that such an obvious thing has to pointed out and even that ‘authority’ (i.e. referring to E. Scott) needs to be sued to make the point. #60: I think to be moral we have to own all of that nastiness. Otherwise we keep doing it, as we are doing at this very moment consuming cheap goods at the expense of oppressive labor conditions and pollution elsewhere. We’re all terribly, terribly guilty, and owning that guilt is one of the few things that has the potential to lead people toward truly selfless acts. I’m no Luddite, but by my reckoning, I don’t see much of anyone giving up much of anything of their comforts in exchange for improving their personal impact on the morality of the world. Out of sight, out of mind. Velikiye Kniaz – Thanks for your note and I’m sorry it took so long to return the comment. Your description of the Russian Orthodox choirs helped me re-live that experience even more powerfully, although it has been 7 years, almost to the day, since we were there. And your hsitorical perspective on the entire issue has added to my knowledge. Thanks again. Someone may have said this already, but I think that the righteously intended worship at many churches, etc, is what leaves traces of the Spirit. No matter what you might think of the Catholic Church, or So Baptist or any other, as an organization, many of their members are truly trying to do the right thing and do love God. The residue of the heartfelt prayers of those people is what you may feel. You only feel what you yourself bring and project, and perhaps whatever communion you happen to be having with the Spirit. That residue is just dust and candle smoke. If you didn’t know that people pray there and revere the site, and expect to feel something, you wouldn’t. Superstition like this doesn’t do anyone any good. It just leads to eventual disillusion with all things associated with spirituality. Although, the fact that prayed-over food still makes people fat when it’s fatty and sick when it’s contaminated is a counter example, since people still ask for blessings on their food. Now if I was a catholic missionary taking advice from mormon missionaries I would tell you “You were feeling the spirit testifying to you that the Catholic church is true”. Isn’t that what we (mormons) would tell others? This is why our spiritual epistimology is so unreliable. Yes, like a piccolo stuck on C two octaves higher than the rest of the orchestra. I wish we could take these experiences with buildings and translate to them to people of other faiths. It seems like we rever their works of art, music, and buildings, but we treat them as “the world”, as something to avoid like the plague, and dismiss their feeling of the Spirit and their testimonies and faith. It feels holy because God is there, too. So what does that say about all religions? That perhaps maybe ours isn’t “the one true church” but that there are many different ways up the mountain, and we all end up in the same place. Each path can be just as good as the other. I agree Olive. Spritual experiences are abound in all religions. Mormons do not have a monopoly on them. Each path is as good as the other. That is why it is illogical and prideful to believe that our spiritual experiences in mormonism are confirmations of literal truths, yet spiritual experience in other faiths are something different. I don’t buy that anymore. I can only conclude (unless I want to give up on believing in God altogether) that spiritual experiences are just inspiring and help us to come closer to communing with God. They don’t testify of literal truths. I can’t accept that anymore. But Owen, you have no idea how much comfort I am giving up by remaining [almost] silent with regard to improving the morality of some commenters in this thread. No idea a-tall. So what does that say about all religions? That perhaps maybe ours isn’t “the one true church” but that there are many different ways up the mountain, and we all end up in the same place. Each path can be just as good as the other. That is a lovely sentiment, and you’re entirely free to adopt it as your belief, preach it to others, and use it in your status updates on Facebook. Just keep in mind that it’s not compatible with Mormonism. Several years ago my wife and I were in New York celebrating our 30th wedding anniversary. We happened to be at St. Patrick’s just about time for the 1:00 p.m. Mass. They do Mass at 12:00 noon and 1:00 p.m. each business day. I really wanted to see Mass, but she wanted to shop next door, Saks 5th Avenue, if I remember correctly. So we agreed that I would go to Mass and she would go shopping, and we would reconnect via cell phone. The cathedral was, of course, amazing, outside and in. I was in awe and felt very reverent. They have it set up so that tourists can walk around the outside of the interior of the cathedral, while they conduct Mass in the center area. It looked like there were about 100 people there for Mass in pews that could easily seat twenty times that number. I just kind of wandered around looking at things and enjoying Mass (in English). When it came time for a prayer, I stopped walking, bowed my head, and closed by eyes. However all the other tourists kept walking, talking, and even taking flash pictures. I was somewhat taken aback. In our custom, no matter what people are doing in one of our buildings, if they are within hearing of a public prayer, they stop what they are doing and wait reverently until it is over. I stopped and waited until the prayer was over and then said amen. I have conflicting emotions about the experience. On the one hand, I was really glad to be a part of Mass at a historic cathedral. I have always enjoyed Catholic Mass. And I think I’m glad they open it up to the entire world. On the other hand, the whole experience seemed a little sacrilegious. I can’t imagine us opening our Sacrament Meeting to the public like that, not to mention our temple worship. Superstition like this doesn’t do anyone any good. It just leads to eventual disillusion with all things associated with spirituality. Owen is right people. Enough with this Holy Ghost and Light of Christ superstition. It is obviously leading people astray, of course these feelings are nothing more than the chemical reactions we create in our own minds . . . Very well put. It is an open mind that sees truth wherever it comes from.